You’re in safe hands with Britt’s Yard Works! Britt's Yard Works is a professional landscaping company serving the Rocky Mount, NC area. For grass cutting and other lawn maintenance, call today! Do you have a large lawn and little time? If you don't have time to cut your grass this week, or even on a routine basis, call Britt's Yard Works in Rocky Mount, NC today! We're here to help when you are overwhelmed by yard work or need a landscaping company to lend a helpful hand with lawn maintenance. For quality grass cutting services, give us a call. We'll give you a free estimate. No job is too big or too small. 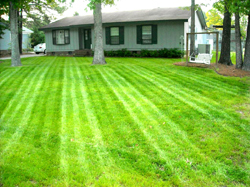 Providing high quality lawn maintenance that gives you satisfaction is our priority. For all your lawn and grass needs, we are the landscaping company you can count on. Any Job, Big or Small - We have you covered! As a landscaping company serving the Rocky Mount, NC area, Britt's Yard Works has over four years of experience. With customer satisfaction as our top priority, we provide excellent lawn maintenance to give you peace of mind. All our services, from grass cutting to landscaping, are completed with nothing less than perfection. We'll give a free estimate, and the person who gave you the estimate will be the person that will complete the work from start to finish. You can trust that for all your lawn maintenance needs, Britt's Yard Works will provide high quality service that is sure to satisfy. A landscaping company you can trust! Here at Britt's Yard Works it's very important that you, the customer, are completely satisfied with our work. You want your yard and landscaping to look great! That's why we work so hard to bring you the best lawn maintenance service that you'll find in Rocky Mount, NC. Our estimates are free, accurate, and fairly priced. Whether you need routine grass cutting or a complete landscaping overhaul, Britt's Yard Works is the landscaping company to trust. Give us a call today to ask about the services we offer!